In the many hours I have spent with the Mortal Empires DLC this weekend, I think I have attained a state of Total War nirvana; a sublime wave of realisation that this is the grand strategy game that I have always wanted, and that nothing else matters (well, except for whatever Creative Assembly have next in store for this series). 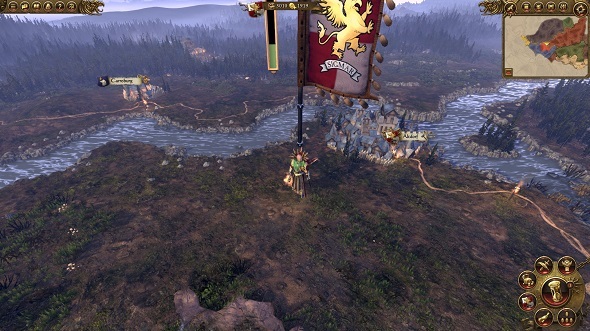 Mortal Empires is part of a huge undertaking for Creative Assembly. 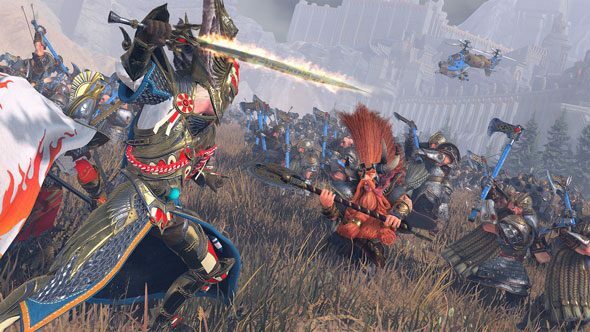 Read our interview with them about creating the Total War: Warhammer trilogy fans are expecting. I have fielded grand battles between Skaven and Dwarves, between Dark Elves and Wood Elves, and arranged a primeval showdown between Lizardmen and Beastmen – that last one is completely non-canonical to Warhammer, I know, but something about this battle tapped into the five-year-old in me, smashing his plastic action figures together. I have begun plotting epic campaigns based on Warhammer lore and my own flights of fancy: to march the Dwarves across the Old World and conquer the High Elf island of Ulthuan in honour of the War of the Ancients, to colonise the New World as The Empire, to unify the Skaven and Orcs in reaving great civilisations, to … to… gah. The possibilities spread out before me like a great dark ocean, formidable yet tantalising. But let’s backtrack for a moment. 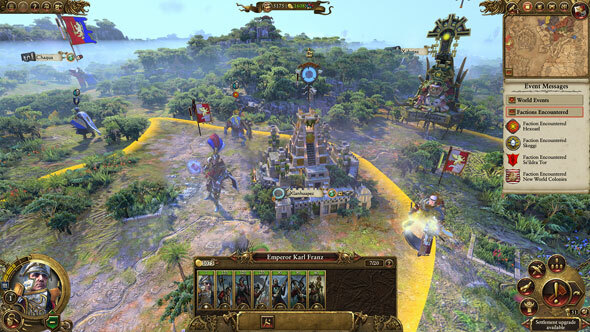 Mortal Empires is Creative Assembly’s first step in merging the Total War: Warhammer world. It is a free DLC for those who own both games in the series so far, combining their campaign maps into one seamless whole, with all the bells and whistles of the sequel’s improved interfaces and deeper campaign mechanics. You can choose from any of the factions across the two games – barring Norsca, who will be added later on – and embark in true Total War style on a sandboxy Short or Long campaign. There are two layers to the campaign victory conditions in Mortal Empires. The first entails faction-specific objectives, which tie neatly into Warhammer canon. For the Old World factions these are the same as they were in the first game, such as retaking the Vampiric lands of Sylvania as the Empire, or wiping out rival Orc tribes as the Greenskins. The New World factions, meanwhile, who previously only had victory conditions specific to the Vortex campaign of the sequel, now get their own sandbox campaigns too. So the High Elf and Dark Elf campaigns set the Elven yin and yang on a warpath, as both need to control all of Ulthuan and wipe out the opposing faction. Queek Headtaker of the Skaven starts in the Old World, and is tasked with wiping out the Dwarves, while fellow ratman Skrolk must deal with the Lizardmen in Lustria. Both Skaven lords also have the pestilent task of maintaining 50% Skaven corruption in specified provinces. Then there are the Lizardmen, whose campaign centres around retaking their muggy jungle homelands and wiping out the Skaven scourge. Of the New World Lords, reptilian warrior Kroq’gar has made the longest journey from his original starting position, finding himself in the far south-east corner of the Old World now. On top of all these new campaigns, the ultimate objective from Warhammer 1 – to defeat the Chaos leader Archaon the Everchosen – now applies to the New World factions too (except for Skaven who, being Skaven, do not give a rat’s arse about impending armageddon. POW). The new second layer of victory conditions really spices things up in Mortal Empires as it gives you a motive to create the kind of inter-continental conflict you have been fantasising about – or, at least, I have. 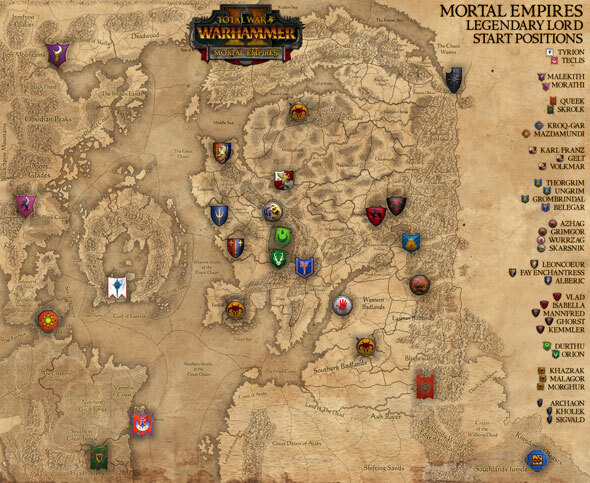 Where in the original you had to control ‘x’ number of settlements of your choosing, now you need to pick them from a list, which is the same for all factions and conveniently includes major settlements dotted all over the vast campaign map. So yes, while you could realistically play an entire game as Empire without getting a sniff of the palms, coconuts, and dino droppings of the New World, the intrepid voyage across the ocean is still presented as a viable – and more challenging – path to victory. 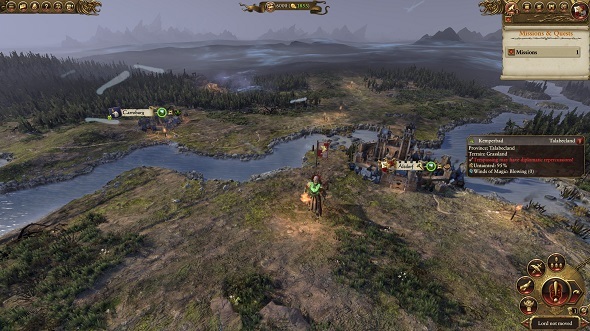 Creative Assembly’s aim with Mortal Empires was to create a sandbox faithful to the Warhammer world, so there are no forced canon-breaking interactions between the two continents. Instead, the task of rewriting the world’s belligerent history – whether it is sending the Lizardmen on a maiden voyage across the ocean to the lands of the Undead, or hooking the Beastmen up with the Dark Elves to wipe out the High Elves – is up to you. To that end, the combined map smushes and rescales much of the New World to make things a little cosier – a logical move given that the population density of major factions in the Old World is like a block of malt loaf to the New World’s croissant. In Lustria, provincial border lines have shifted, while certain settlements and a small percentage of minor factions have been omitted completely (Reddit user Zorgaz has compiled an unofficial list of cut factions, if you’re interested). Without meaning to trivialise the systemic culling of entire tribes of peoples and non-peoples, that still leaves a total of 117 factions and 35 playable factions on the campaign map, so we are still looking at one of the most diverse strategy campaigns in existence. The oceans and seas between the Old and New World have also shrunk, making the odyssey across the pond less foreboding than you might have expected. Again, these little tweaks make it easier for factions to interact – which, in this world is more or less a euphemism for war. With the Old World factions retaining their starting positions from Warhammer 1 (Creative Assembly told us these are likely to be shaken up in future patches), I took the opportunity to compare the performance and graphical differences between the original game and Mortal Empires. I took plenty of screens comparing the exact same areas areas with each other, which have turned up some pretty big visual differences between the two games. The below pictures of the Empire starting position in Warhammer 1 and Mortal Empires are both with Ultra specs at 1920×1080, with the only difference being that I had the new ‘Sharpening’ option switched on in Mortal Empires. You can see that the colour filter has been cleaned up, losing that sickly purple tint from the original game. Ground textures appear to have a higher resolution, and even the design of the settlements has changed, moving towards a more Gothic architecture, and featuring nice details like more shading and smoke coming out of chimneys. The water in the river has lost its exaggerated lighting effect for a more understated, natural look, and the shading on Lord Volkmar is more moody and pronounced. All in all, everything on the campaign map looks sharper and more blended (note also UI tweaks, such as icons – including climate – next to the city names, and army flags that do not take up half the screen). The one criticism I have is that the fog of war you see in the background is much closer in Mortal Empires, whereas in the original you can see forests stretching off into the distance. Another caveat to this cornucopia of conflict is AI turn times, that eternal bugbear of Total War games. Playing as the High Elves, I had to wait in excess of 30 seconds by turn 80 or so, when the map was brimming with activity on either side of Ulthuan, even with the animation and turn speeds at full throttle. Creative Assembly have been relaxed about this, talking about it as a necessary evil in delivering a campaign at such an unprecedented scale. And maybe it is for now, but as they continue to refine and polish this grand project, I hope that this issue works its way up to the top of the priority pile. As it stands, the time scale for the AI to make its moves does not feel designed for the scale of game CA are creating here, and I dread to think how long everything will take when the third game’s chunk of world joins the fray. With Quest Battles migrated over from Warhammer 1, the only reason to go back to the original would be for the campaign intro cutscenes, which are not really enough to justify playing through a smaller, uglier, and less-polished version of much the same game. For all its lengthy turn times and strenuous hardware demands, Mortal Empires is an impressive piece of work, proffering endless scenarios and tales of conquest in what is the first big step to making the best part of the Warhammer world a Total War reality.